Every successive performance, broadcast, and now recording, from the BBCSO under its new chief conductor further vindicates the orchestra’s decision to welcome home Scotland’s prodigal son. 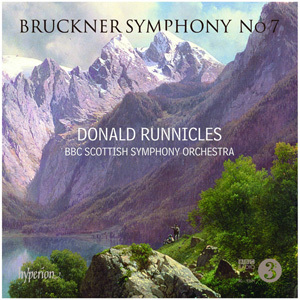 For his first recording project in this position, Runnicles has taken a small step from the Wagner for which he is best known to Bruckner’s most popular symphony. The results are impressive, and show Runnicles to be a Brucknerian of considerable insight and conviction. He has yet to get the orchestra playing this music with the fully idiomatic sensibility that he might expect from a Central European band, but this is still a Bruckner Seven that’s well worth hearing. Patience is Runnicles’s watchword throughout this reading. He has a clear vision of the work’s structure and, by carefully choosing his tempos, which are often on the steady side, he ensures that no single section disrupts its overall balance. Phrases are shaped with very subtle rubato combined with more overt dynamic swells. He sometimes lingers on the Ruhig placeholder sections in the transitions, but never abandons the underlying tempo. There is gravitas aplenty in the tuttis, but the power of his climaxes is achieved more through the contrast between these sections and the lighter episodes. That sense of lightness is all too rare in Bruckner interpretation, and it’s a real asset here, especially in the playful interludes of the Adagio and the opening of the finale. Even more impressively, he is able to finely grade the long transitions from one to the other. Runnicles has obviously put a lot of thought into how the long build-ups can work, and his only noticeable deviation from the score is to occasionally begin these crescendos a few bars earlier than written. The precise control that he exerts over the sound throughout these crescendos gives them all the more impact, and the patient preparation for the climax of the Adagio is particularly impressive. The orchestra is sympathetic to Runnicles’s approach and matches his interpretation in its balance of discipline and passion. The only downside to this recording—and it is quite a serious one—is that the band doesn’t provide the warm, enveloping sound that we are used to hearing from German orchestras in this repertoire. The strings have good ensemble and intonation, but their sound is just too thin. The same goes for the brass, especially the trumpets. The woodwinds give some excellent solos, but when heard together don’t have the fine balance of ensemble that Bruckner regularly requires. Occasionally, the focused orchestral sound works to the music’s advantage. At the opening of the Adagio and in the Trio of the Scherzo, the strings find a measure of warmth, which goes some way toward compensating for the narrowness of their textures elsewhere. Given Runnicles’s short tenure to date with the BBCSO, we might consider this partnership to be a work in progress. Runnicles proves here that he is an inspiring Brucknerian, and it would certainly be in the orchestra’s interests to continue exploring this repertoire under his baton. In fact, a rumor has reached me from north of the border that this Seventh Symphony is soon to be followed by a recording of the Eight. If it is of this quality, then that too will be well worth looking out for, and if in the mean time the orchestra can work on the warmth of its sound, at least when playing Bruckner, then so much the better. This review appears in Fanfare Magazine issue 36:5.